Maya (22 Jump Street’s Amber Stevens West) is left scrambling when she finds her fiancé “fooling around” with another girl. Having met the man of her dreams while visiting Africa, she returns home with a lie that will convince her parents that she still has her life on track. 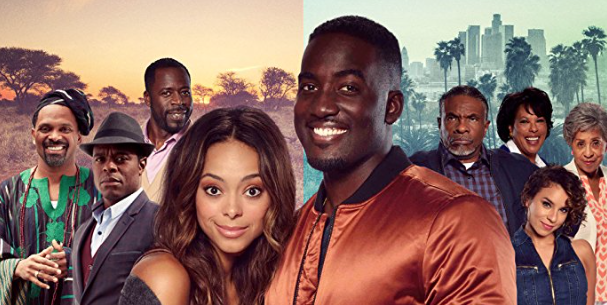 A kind stranger named Malcolm (Shamier Anderson) meets Maya during his own panic as a greedy former friend (Tyrell played by Lyriq Bent) chases him down. This levelled desperation ties Maya and Malcolm together as they devise a staged marriage and a phoney love interest that will keep her family and Tyrell at bay. A charismatic cast saves Love Jacked, a film with the presentation of an elevator-pitched sitcom that’s been repackaged by director Alfons Adetuyi as a fluffy feature-length rom-com. The actors are stuck in a convoluted mire of a story that’s been written by Robert Adetuyi, a sore circumstance that brings back bad memories of Robert’s equally tangled Jason Bourne spoof Code Name: The Cleaner. But – like cogs in a machine – the performers work within their own efficient element in order to work together to make an entertaining movie. The ensemble’s greatest achievement is keeping Love Jacked cute and inoffensive; a seemingly daunting task when Malcolm’s alter-ego “Mtumbie” is a larger-than-life stereotype. West and Anderson are a sweet pair, but the actors are at their best when they’re spinning a yarn to make “Mtumbie” convincing. Maya’s funny family have their moments to shine (including Keith David, Marla Gibbs, Nicole Lyn), but comedian Mike Epps (as African culture enthusiast Uncle Rufus) is a standout in his rare straight-man role. Rufus’ fascination – along with unsuspected and all-too convenient appearances by other characters – is what fuels this hoax and challenges this otherwise ordinary flick.